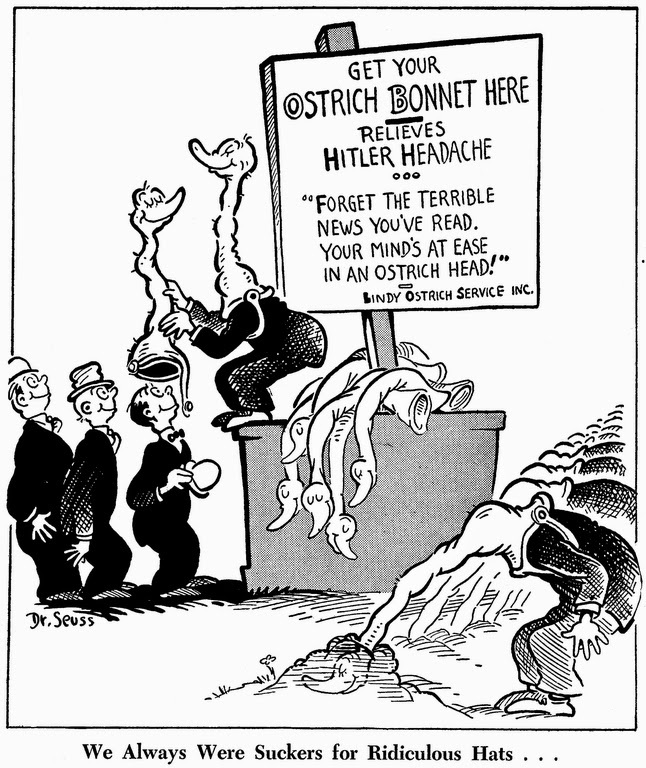 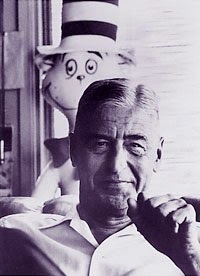 known for his world-famous children’s books such as Green Eggs and Ham, The Cat in the Hat and The Lorax published under his pseudonym Dr. Seuss, Geisel achieved early fame in 1928 for his artwork in a hugely successful advertising campaign for Flit, an insecticide manufactured by the Standard Oil Company. 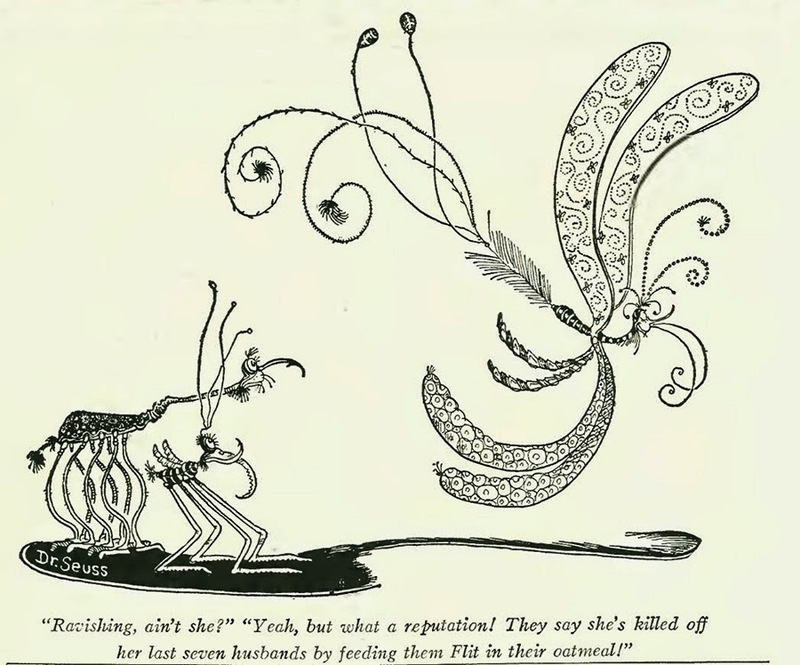 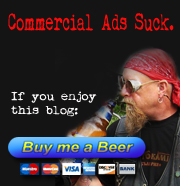 The campaign’s catchphrase, “Quick, Henry, the Flit!” became a part of popular culture in the United States for almost 17 years, spawning a song and punch lines for famous comedians such as Fred Allen and Jack Benny. 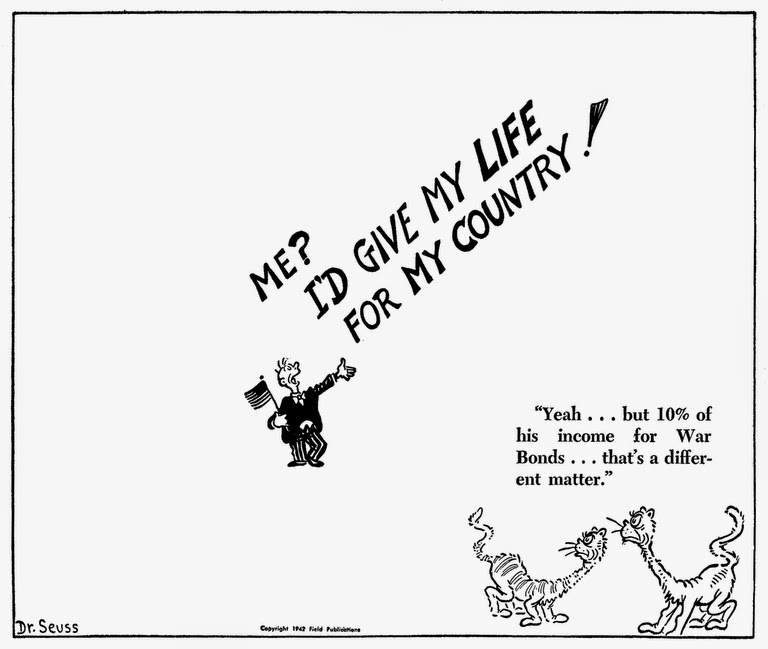 Soon Geisel’s work was appearing regularly in magazines like Life, Liberty, and Vanity Fair, and he was drawing advertising for General Electric, NBC, Standard Oil, Narragansett Brewing Company and many other companies. 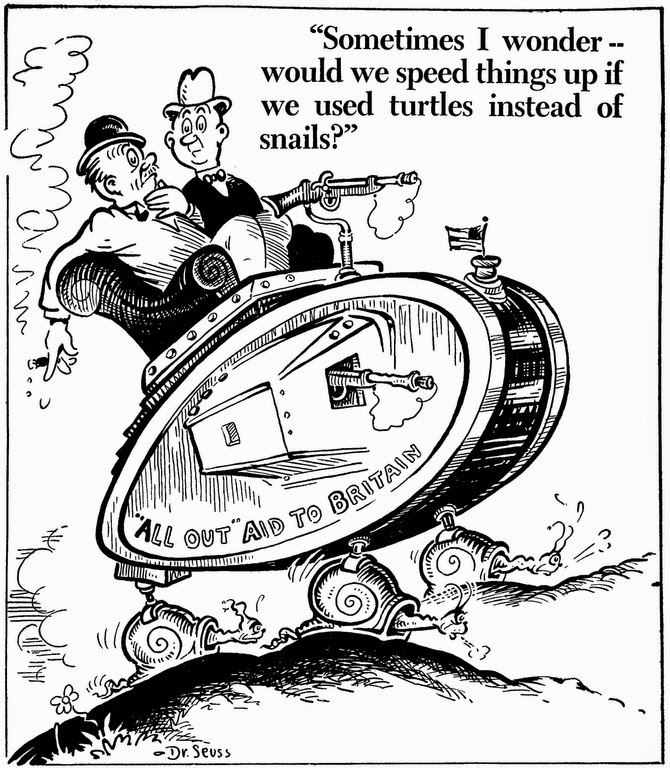 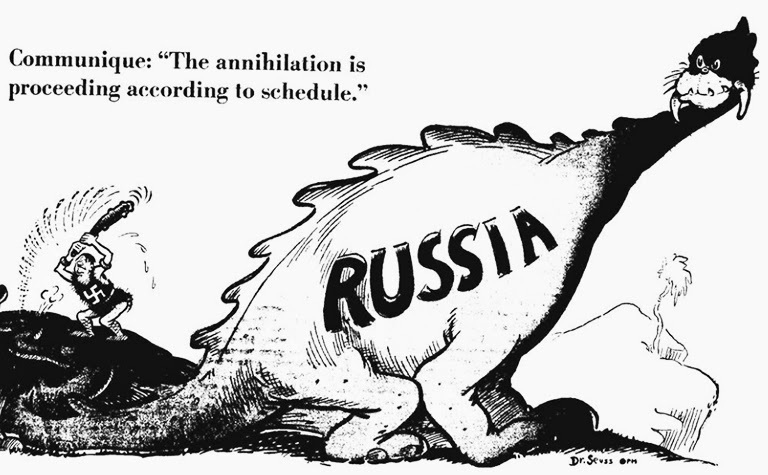 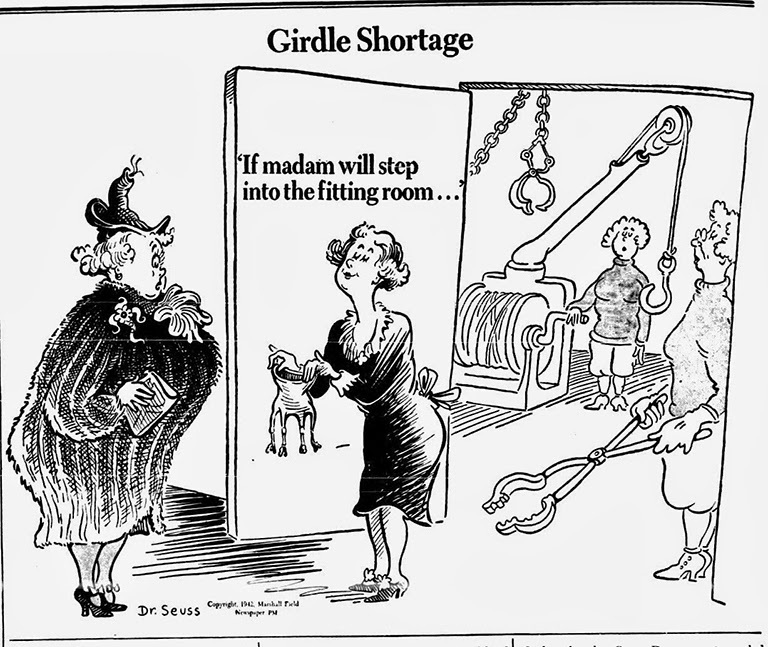 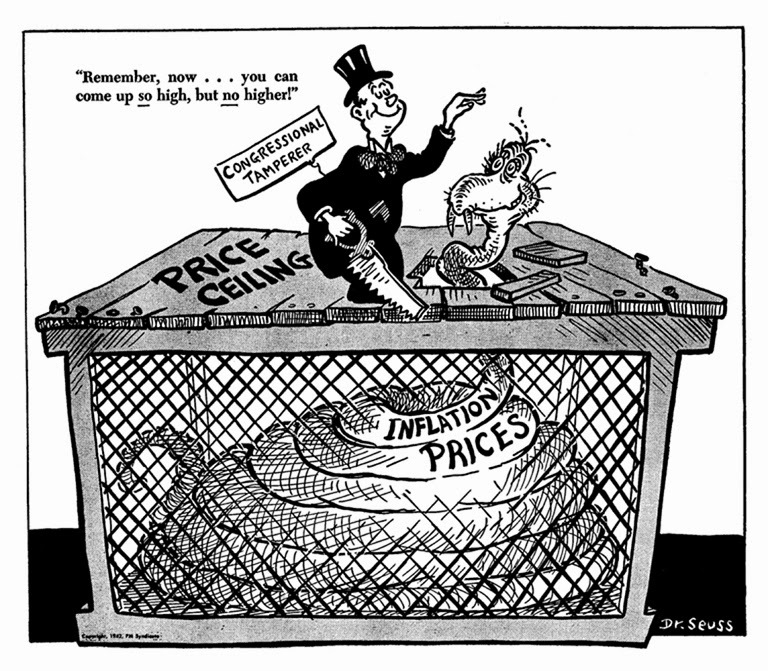 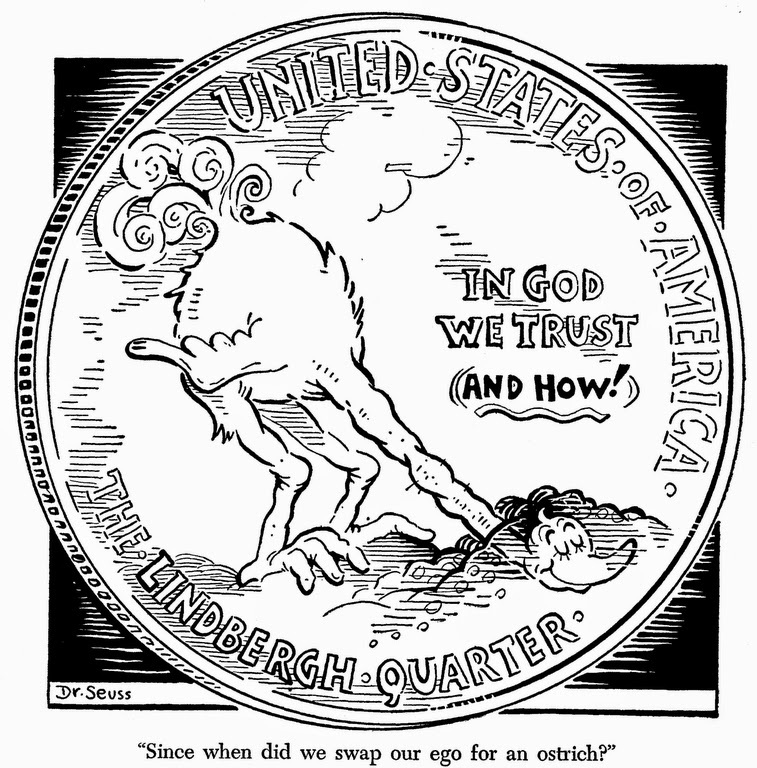 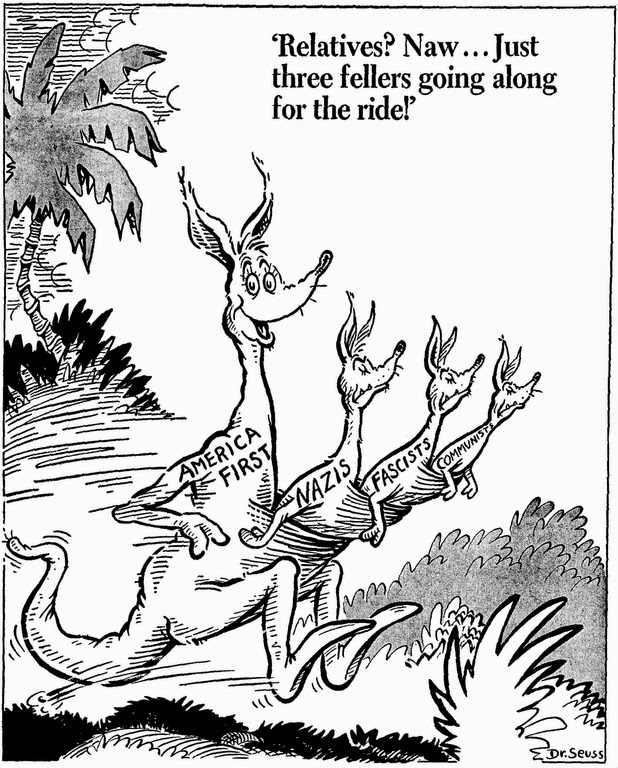 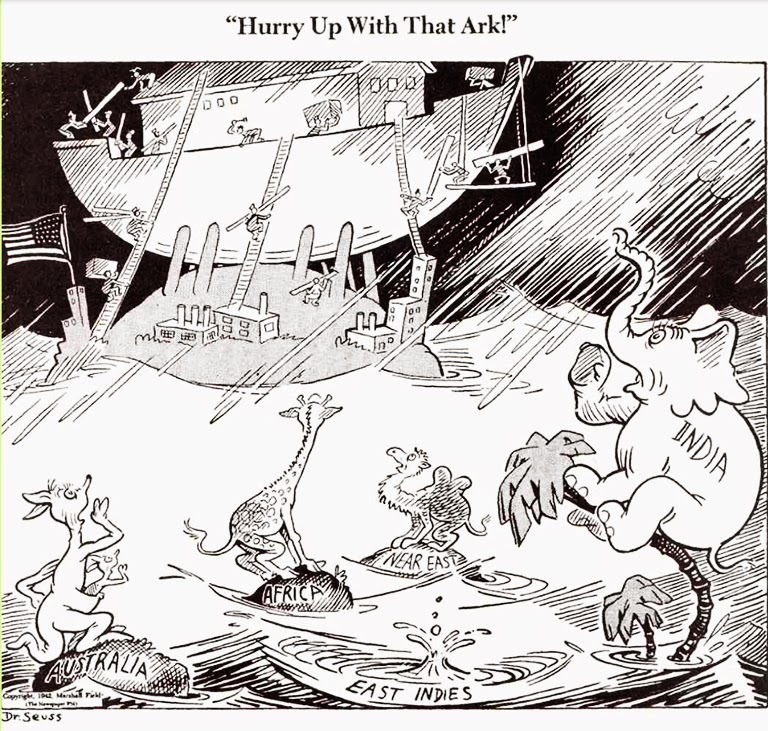 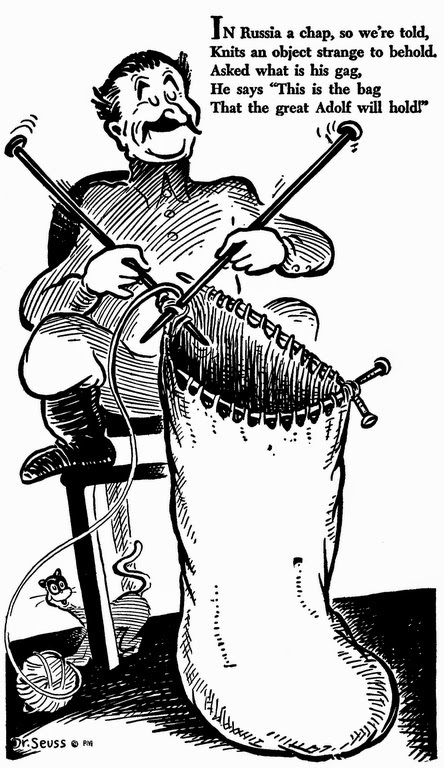 In 1941, Geisel was hired to draw political cartoons by the New York City daily newspaper PM. 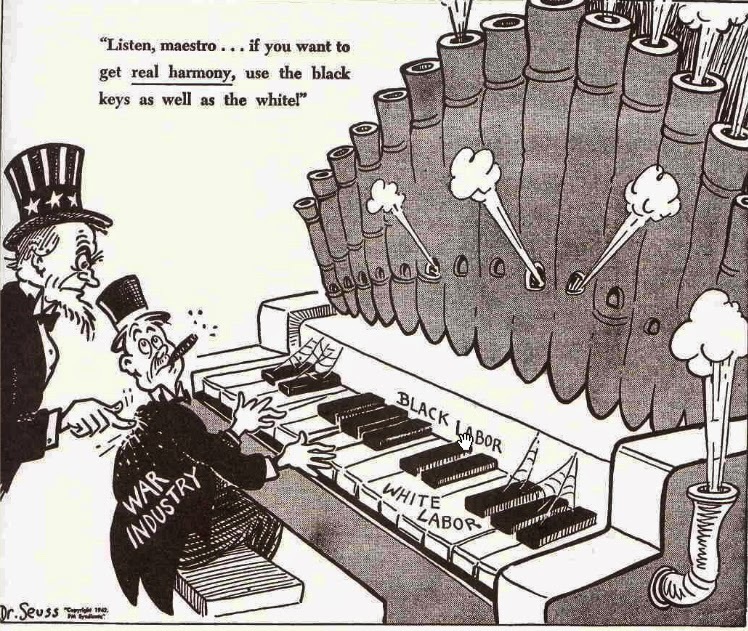 Published by Ralph Ingersoll (New Yorker & TIME magazines) from June 1940 to June 1948 and financed by Chicago millionaire Marshall Field III. 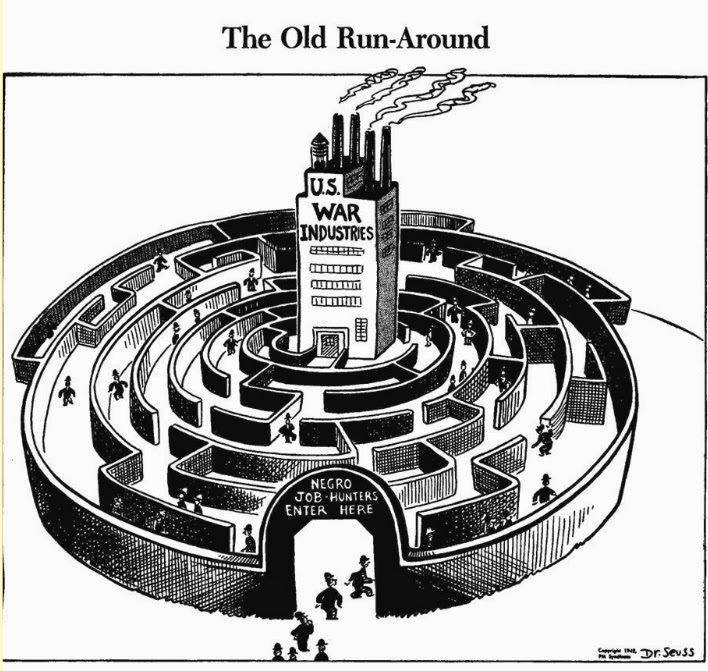 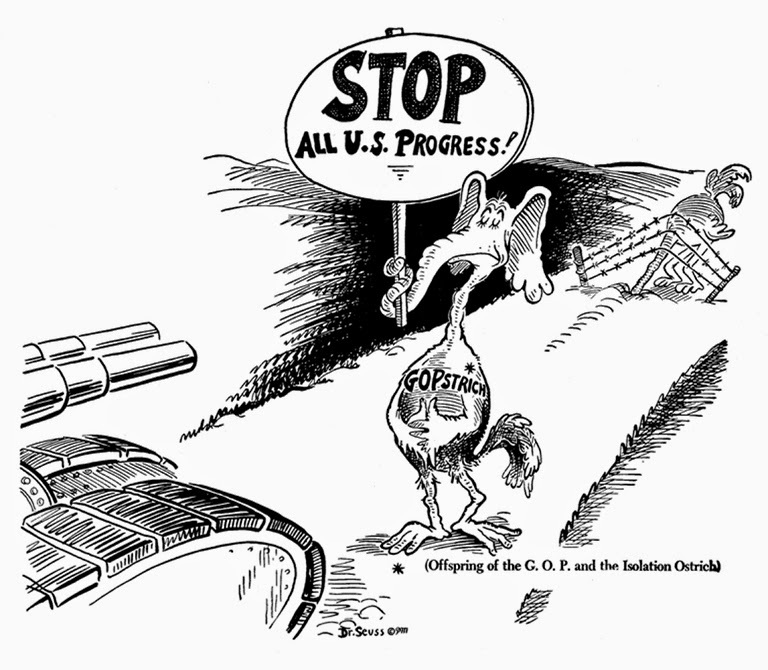 The PM was politically left-leaning, supportive of the New Deal, and highly interventionist. 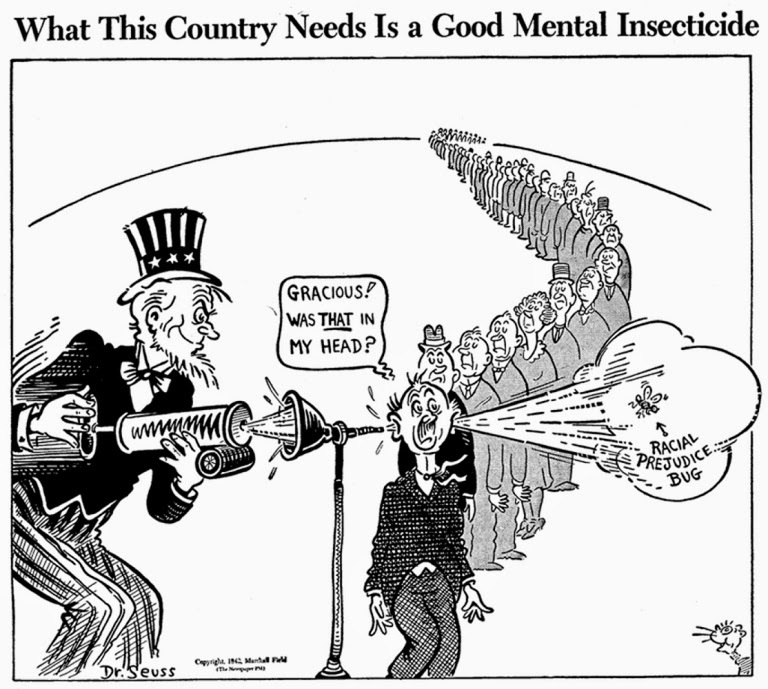 Geisel supported the Japanese American internment during World War II, and his attitudes towards Japanese and Japanese Americans has struck many people (responding with hindsight) as a moral blind spot. 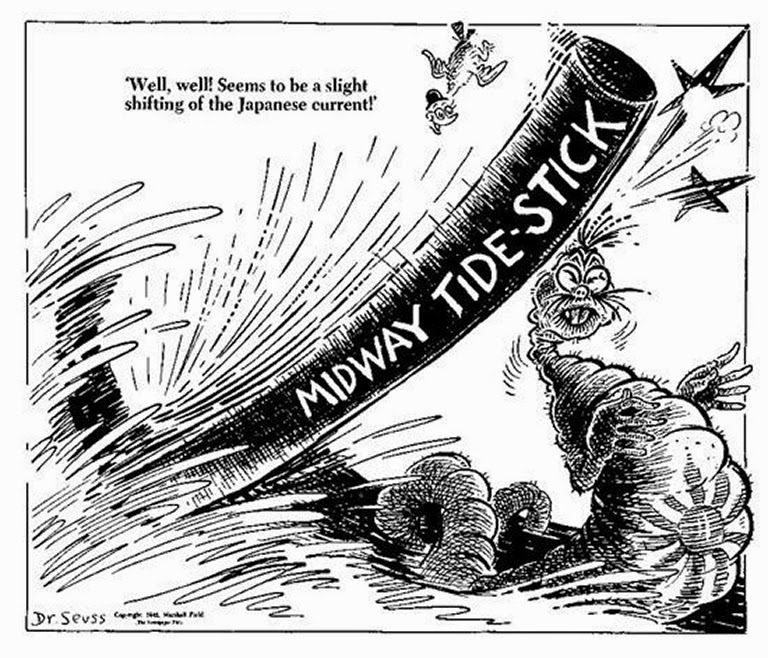 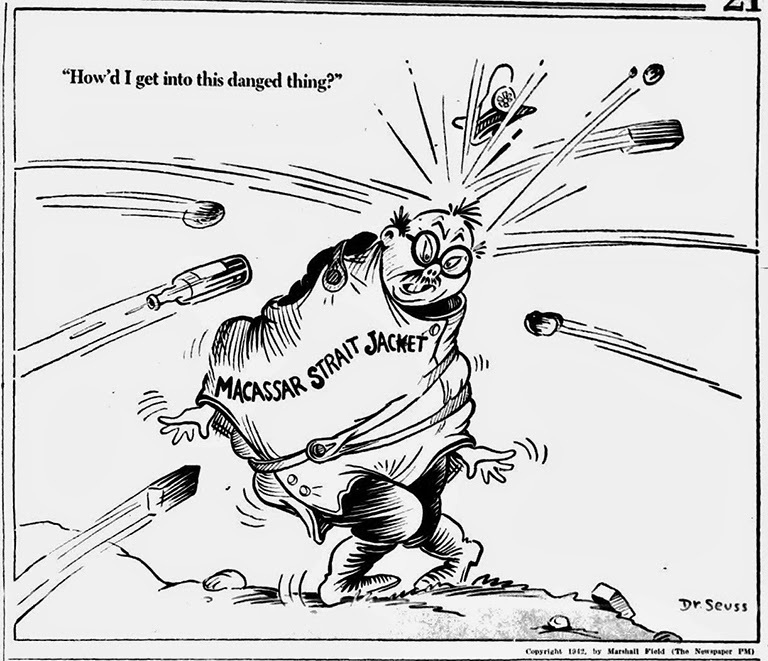 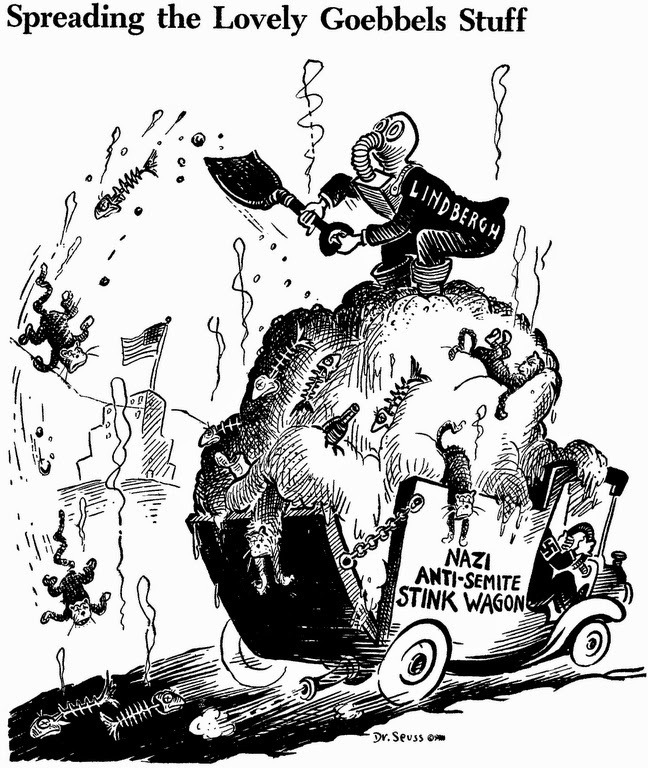 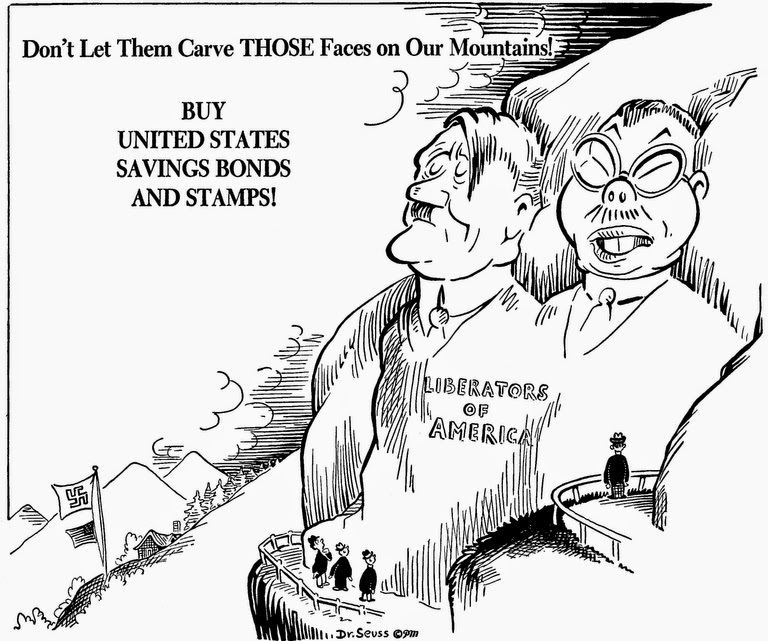 One cartoon depicted all Japanese Americans as latent traitors or fifth-columnists: but at the same time other cartoons deplored the racism at home against Jews and blacks that harmed the war effort. 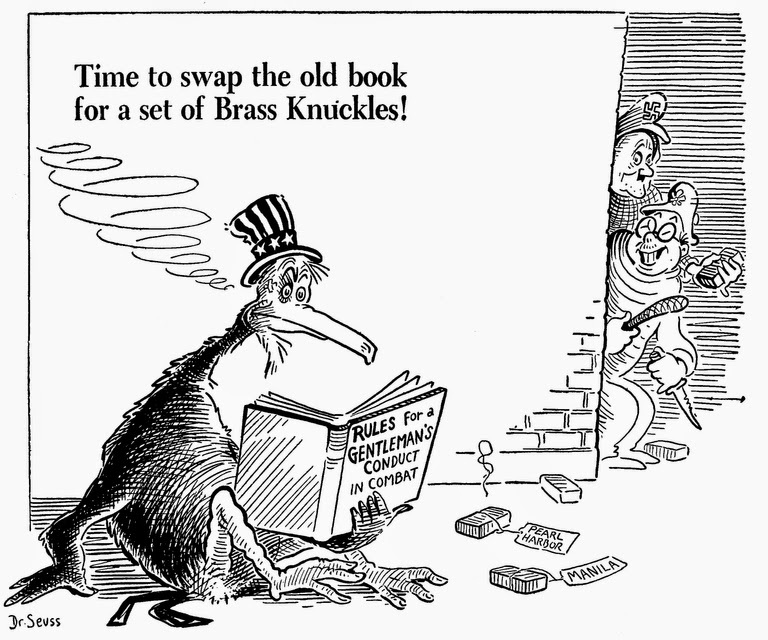 After the war Geisel overcame his feelings of animosity and used his book Horton Hears a Who! 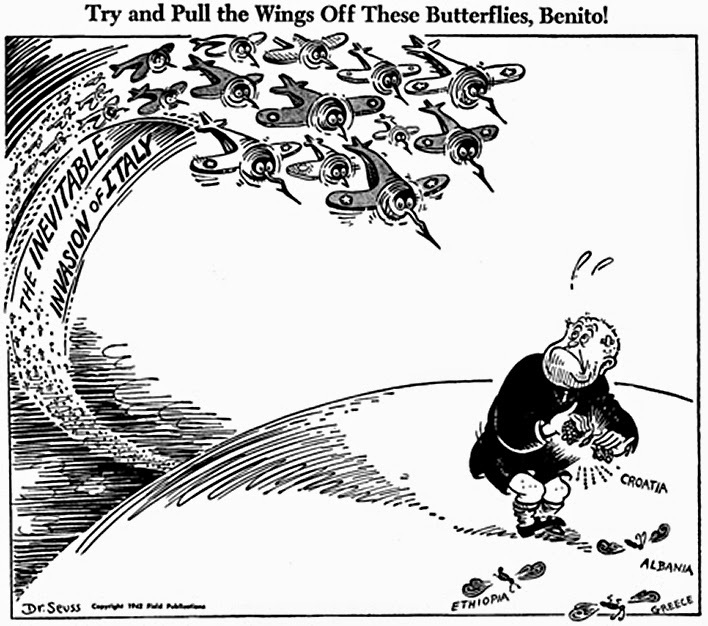 (1954) as an allegory for the Hiroshima bombing and the American post-war occupation of Japan, as well as dedicating the book to a Japanese friend. 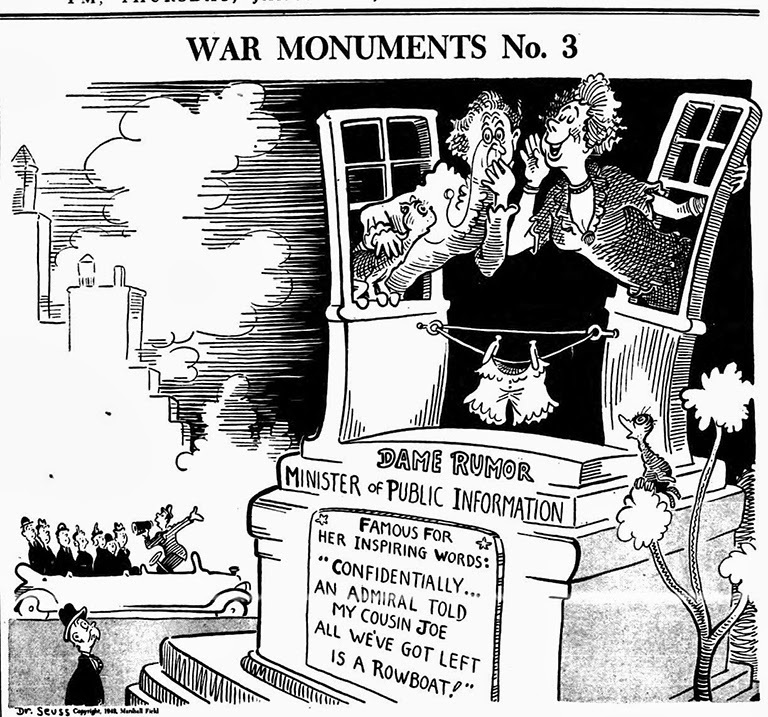 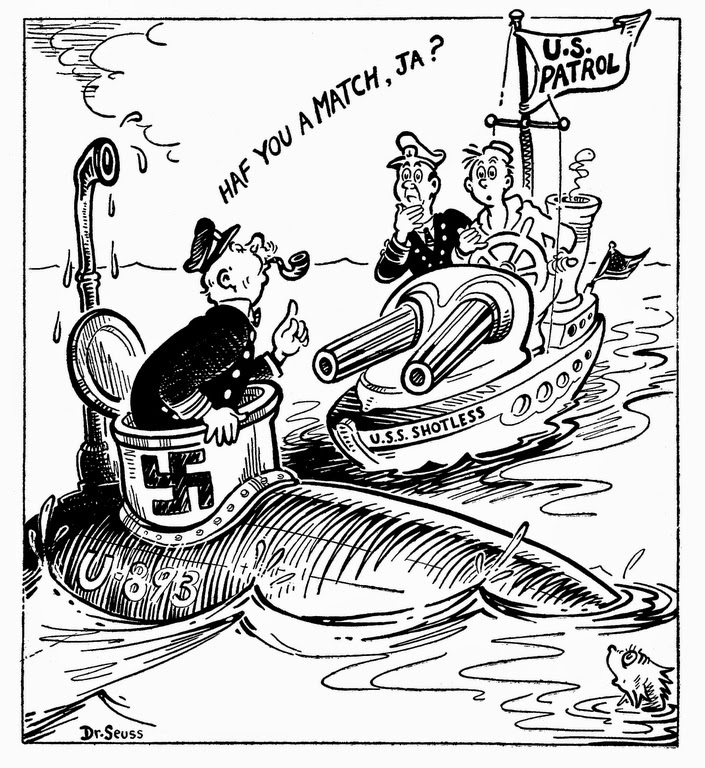 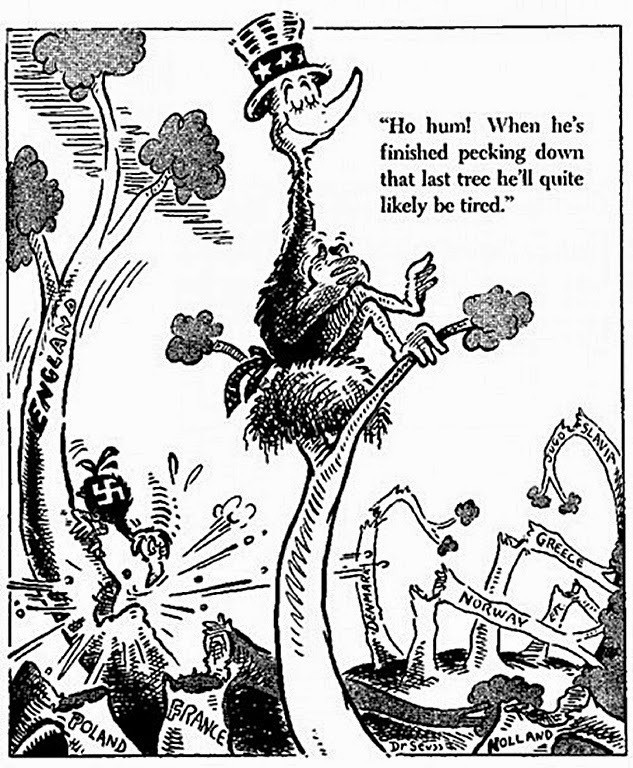 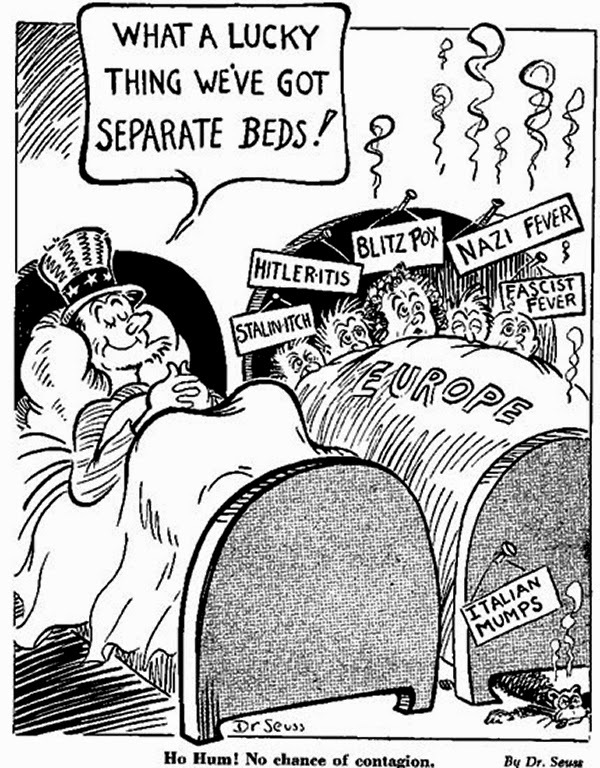 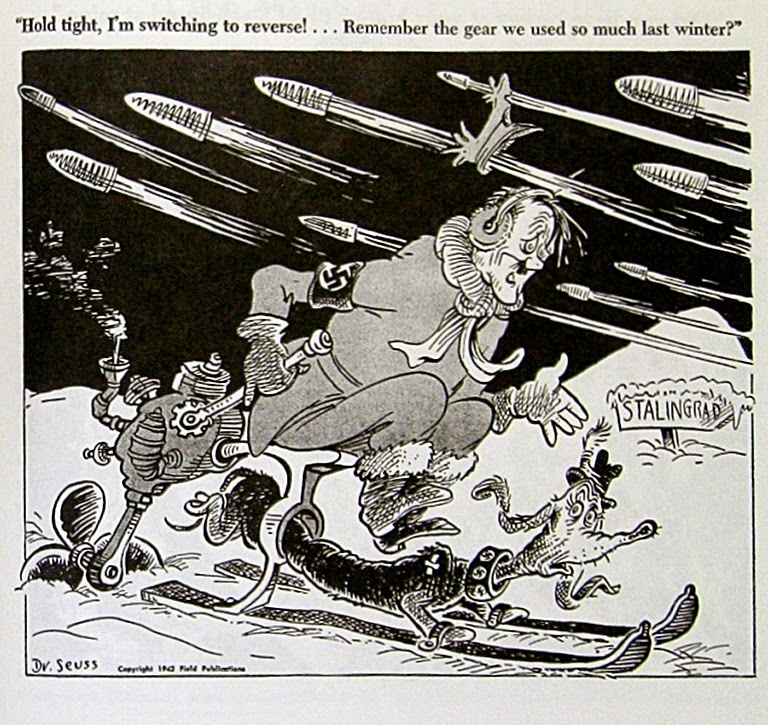 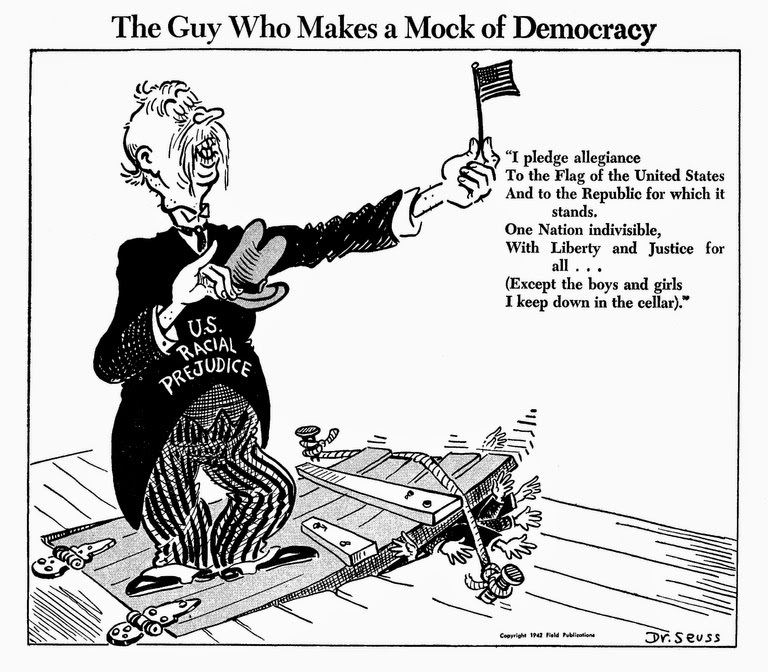 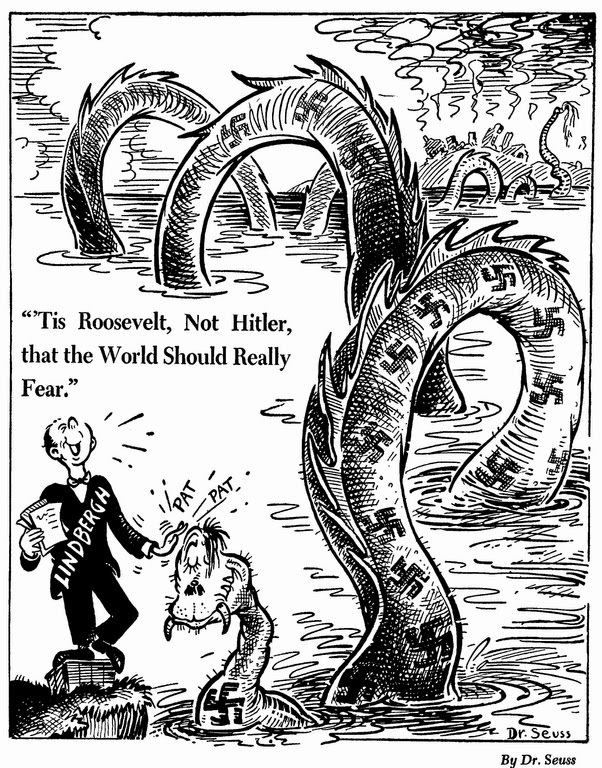 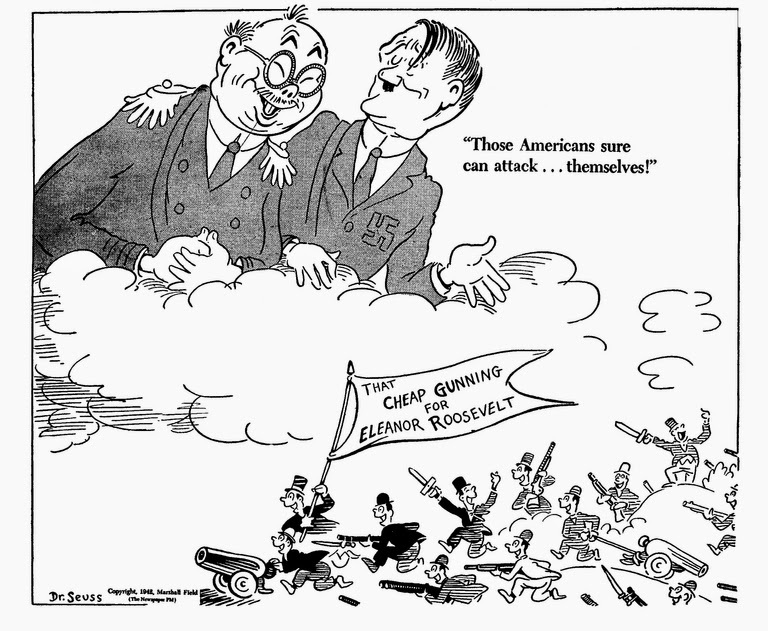 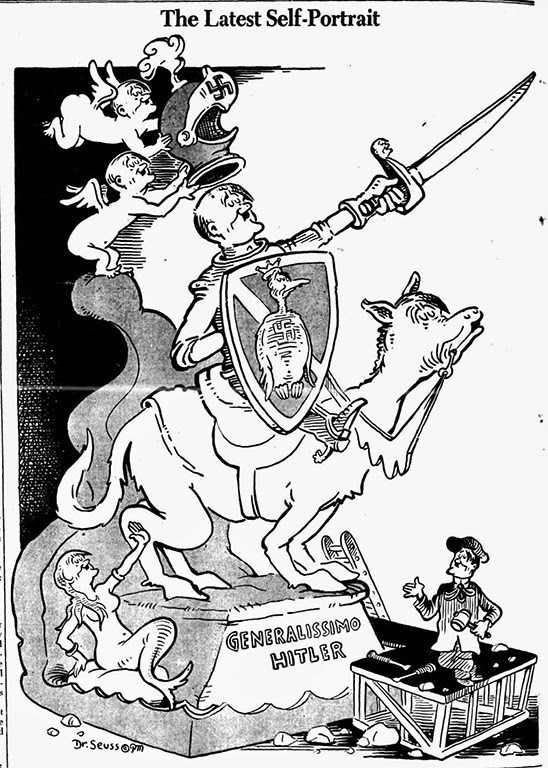 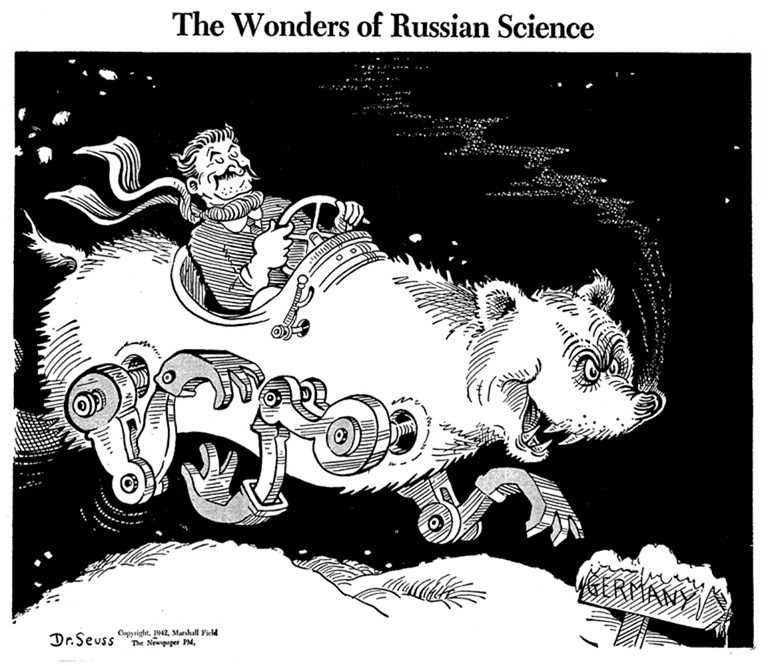 His cartoons were strongly supportive of President Roosevelt’s handling of the war and also featured frequent attacks on Congress (especially the Republican Party), criticism of aid to the Soviet Union and the investigation of suspected Communists, and strong statements against any other offenses that he felt lead to disunity and support for the Nazis, intentionally or inadvertently. 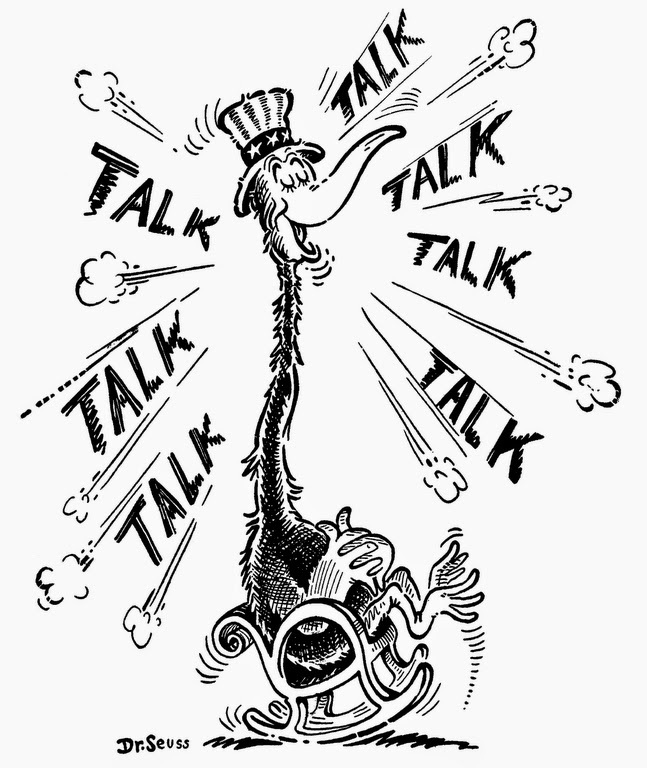 Theodor Seuss Geisel died of oral cancer on September 24, 1991, at his home in La Jolla at the age of 87.